Hettich centrifuges and incubators are designed, engineered and manufactured at the company’s headquarters in Tuttlingen, Germany. We combine quality materials and experienced German engineering to deliver products with the performance and durability to meet our customers demands. We deliver products with the performance and durability to meet our customers demands. See what we have to offer. We produce quality products that are matched by quality customer service and product support for the life of your instrument. Hettich equipment is made in Germany with high-quality, durable materials for an extended product life. 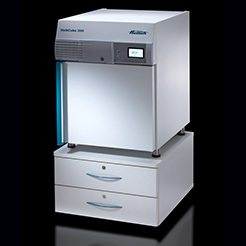 Our centrifuges and incuabtors require low-cost preventative maintenance and are designed for operational efficiency. Our units have a long service life with spare parts available for up to 10-years after product obsolescence. Hettich centrifuges and incuabtors are designed for quiet operatation and will not contribute to the excessive noise levels within a lab. Our thoughtful product design, intuitive control panels and high quality materials make for products that are easy to use, easy to operate and easy to clean & maintain. We manufacturer our products under strict regulatory guidelines for user safety and quality assurance. We are an ISO 9001, 13485 and 14001 certified company, FDA registered and audited manufacturer and our products safety-tested and certified in accordance with all relevant global production standards. This is all backed by more than 115 years of manufacturing know how.